Efforts to improve the outcomes of surgical coronary revascularization have taken many forms, but among the most successful have been bilateral internal mammary artery (IMA) and radial artery (RA) grafts. It has been clear for some time that saphenous vein conduits have limited life span, and that multiple IMA’s improve graft patency and clinical results (1-3). Recent refinements in RA preparation and management (4) have taken RA patencies close to IMA’s, now providing surgeons with up to four excellent arterial conduits. With four arteries and liberal sequential grafting methods, most patients can benefit from all-arterial grafts. This article will review the current status of “all-arterial” coronary bypass in current clinical practice. While a right IMA to LAD coronary bypass was among the first coronary revascularizations performed and reported in 1967 (5), the subject was controversial until Loop and associates demonstrated clear clinical benefits in the early 1980’s (6). With adoption of routine IMA-coronary bypass, efforts at using more IMA conduits expanded, and evolved into the techniques of sequential and bilateral IMA grafting (also termed internal thoracic artery [ITA] bypass) (7-9). Objective documentation of clinical benefits subsequently emerged (10), and all-arterial coronary bypass became an attractive surgical option for multivessel disease patients. While all-arterial bypass has become the most common CABG procedure in much of the world, recent assessment of US practice showed only about 4% of CABG cases involved both IMA’s (11). With so much information showing clear clinical benefits, an expansion in IMA use in the US should be encouraged. In the authors’ practice, certain principles have been useful in the transition to all-arterial coronary grafting, and subsequent sections document concepts involved with the evolution of this approach. All-arterial coronary bypass should start with multiple IMA grafts, which are the well-validated long-term conduits for coronary revascularization. Single LIMA bypass with RA’s constructed as T-grafts probably do not substitute prognostically for multiple IMA’s (12). For some time, the authors have been performing multiple IMA bypasses in 75-80% of multivessel patients (3), including valve/CABG cases. Pedicle grafts and running polypropylene anastomoses generally are preferred. Performing bilateral IMA grafts is more time-consuming and technically demanding than saphenous vein procedures. One optimization factor for bilateral IMA’s has been liberal use of right IMA (RIMA) to LAD grafts (Figure 1A). In the authors’ series (3), RIMA to LAD procedures (Configuration A) were employed in 2/3rds of patients. Historic concerns regarding sternal re-entry with intact RIMA’s traversing the midline have been dispelled by covering the graft with the thymic fat pad at the conclusion of the procedure, along with knowledge that only 4-5% of these patients required re-operation after 20-years. After placing the RIMA to the LAD, the left IMA (LIMA) usually was used for single or sequential grafting of the circumflex coronary system. The 1A approach optimized patency advantages of multiple IMA grafting, since both grafts have early patency rates of close to 100% in this configuration (1,13). Alternative configuration B, used in 1/3rd of multivessel disease patients, involved placing the LIMA as a simple or sequential graft to the LAD system, and anastomosing the RIMA to the RCA (Figure 1B). This technique was applied more commonly in patients with proximal RCA stenoses, in which the RIMA could reach the mid-RCA easily. Patencies and outcomes with this configuration have demonstrated equivalency to alternative A, understanding that in both approaches, IMA grafts should be placed to the largest, most important coronary vessels (3). Although free IMA patencies have been good (1), free IMA grafts have been used infrequently in the authors’ practice, in order to simplify the procedure and to mitigate the necessity for extra anastomoses. However, if a free IMA offers solutions to address complex anatomic problems, there is no hesitation to use free grafts, usually connected proximally to the ascending aorta (1). One such example is anatomy warranting a sequential LIMA to important LAD-diagonal vessels, in the setting of a large obstructed CCX system. The grafting strategy in this situation utilizes the LIMA for sequential LAD grafting, and a free RIMA is placed to one or more CCX vessels (configuration C). Outcomes with radial artery (RA) grafting have been variable and controversial, possibly due to differences in preparation techniques. The Brompton randomized trial (4) was a breakthrough in RA bypass, and for the first time, validated RA techniques with excellent late graft patency data. Proper preparation of the RA was important in the Brompton trial in order to optimize graft patency, which exceeded 95% at 5-years in randomly selected patients (4). Important graft preparation methods include: vigorous distension of the entire graft (including the area of the distal anastomosis) with autologous heparinized whole blood to “break the arterial spasm” (after all, this vessel is an artery and is subject normally to high arterial pressures); use of calcium channel blocking agents both in the distending blood and postoperatively for 6 weeks; and grafting only to coronary vessels with > 75% stenosis, in order to prevent a “string sign” from competitive flow. In the A and C configurations (RIMA/LAD-LIMA/CCX and SeqLIMA/LAD-FreeRIMA/CCX), the extra length of the RA facilitates revascularizing the distal RCA with either simple or sequential anastomoses (Figure 1A). In the B configuration, the RA is anastomosed to the circumflex system as a simple or sequential graft (Figure 1B). Proximal RA anastomoses usually are performed to the aorta (14), and the conduit is used frequently for sequential coronary grafting (15). Because of lower patencies of RIMA grafts to CCX vessels through the transverse sinus in our early studies, these grafts are avoided, although better data have been published recently (16). While imaging of arterial grafts in our early series was performed with r-wave gated digital subtraction or conventional angiography (1), the recent development of high-resolution, gated, computed tomographic angiography (CTA) has facilitated on-going validation of evolving surgical techniques. The ability to achieve > 95% patency for most IMA and RA configurations (1,4) has produced almost uniform early postoperative graft patency in current practice. In Figure 2 are representative CTA images of postoperative all-arterial bypass grafts in configuration A. The RIMA graft to the LAD and a sequential LIMA graft to 2 CCX marginal arteries are evident. In this configuration, the RA is used for the distal RCA, and because the RA is longer, it will reach to distal-most RCA branches. 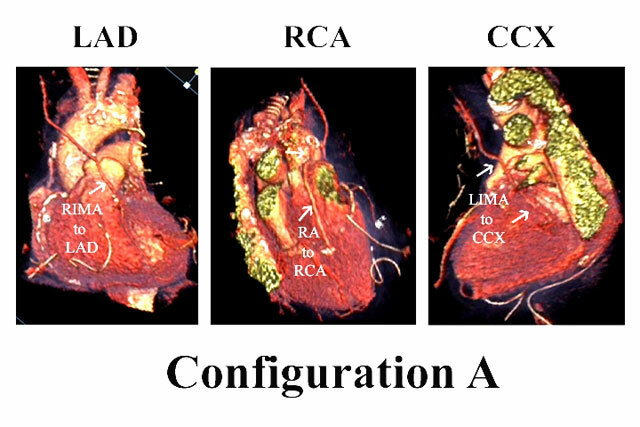 Likewise, Figure 3 illustrates configuration B, in which LIMA-LAD and RIMA-RCA grafts are constructed. In this configuration, the RA is used for simple or sequential grafting of the CCX system, and again because of conduit length, the RA is capable of reaching distal CCX branches, if necessary. Finally, in special cases, free IMA grafts are performed (configuration C). 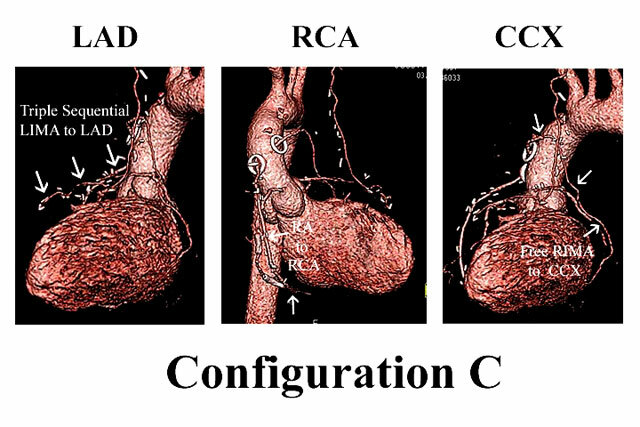 Figure 4 depicts coronary anatomy that mandated revascularization of 3 anterior wall vessels with a triple sequential LIMA graft, in the setting of a compromised important CCX system. Therefore, the RIMA was constructed as a free graft to the large CCX vessel. The RA graft was used for the least important and previously infarcted RCA system. Thus, the relative size and importance of the coronary vessels and size of the viable myocardial regions are considered in configuration decisions, as well as capabilities of individual arterial grafts in terms of length, coronary size-match, etc. However, in over 75% of multivessel patients, at least 2 IMA’s are used (3), and the LAD is almost always revascularized with an IMA graft. Many studies have demonstrated improved outcomes with multiple arterial grafts (1-3,17,18-22). 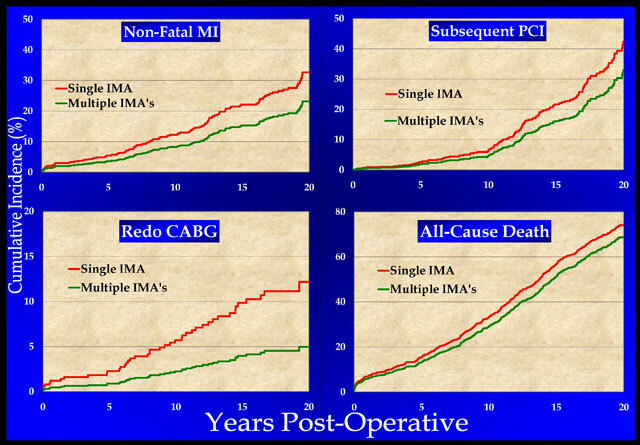 In our series, a multiple IMA approach to a mean followup of 20-years (3) was associated with significant long-term reductions in death rates, non-fatal myocardial infarction, PCI, and redo coronary bypass (Figure 5). At an interval of 15 years after surgery, 19% of patients having multiple IMA grafts benefited clinically (17), as compared to single IMA’s and vein grafts. In the authors’ view, this number justifies performing all-arterial grafts in 75-80% of multi-vessel disease patients, including those having valve surgery with concomitant coronary disease. More recent studies in the Duke databank involving larger sample sizes and longer followup are on-going and are confirming these findings (23). Out to over 25 years of followup, composite outcomes seem to improve as arterial grafts increase (Figure 6), although this analysis is in preliminary stages and needs more scrutiny. Multiple IMA grafts seem to achieve the best results, although the magnitude of difference suggested in Figure 6 may diminish after multivariable analysis is applied. Lastly, ample data exist to confirm improved outcomes with RA conduits as adjunctive grafts to IMA’s (as compared to saphenous veins) (24). So in summary, most studies confirm the benefits of performing more arterial grafts, and support the current trend toward all-arterial coronary bypass. Meticulous surgical technique should be applied in harvesting fragile IMA and RA vessels to prevent spasm or intimal tears causing dissection. Adequate flow should be confirmed before graft deployment to prevent the disastrous consequences of inserting a “bad” IMA or RA (25). With experience and gentle technique, however, vascular injury during harvesting can be minimized. Sometimes, an IMA graft can be small, and it is often helpful to cut the vessel back to an adequate diameter for better flow. Occasionally, this requires shortening the IMA considerably and then converting it to a free graft. Finally, RA grafts require very precise harvesting and proper preparation (as described above) to prevent local dissection or graft spasm, also termed a “string sign”. Several other potential disadvantages of IMA grafts have been described. First, many studies have shown higher rates of sternal infection with MIMA grafting in diabetics (26). The subject of sternal infection involves a number of complex multivariable issues, including operating room technique and others (27). Graft skeletonization can be helpful (28), but another important factor is effective topical antibiotic irrigation at the end of the procedure which, in several randomized trials, reduced sternal infection rates from 2-3% in control groups to around 0.5% (29). With such methods (Vancomycin - 1 gm and Gentamicin - 80 mg in one liter of warm saline for irrigation at the conclusion of the procedure), it has been possible to liberally apply bilateral IMA procedures, so that diabetics can undergo routine all-arterial grafting with negligible sternal complications. Bilateral IMA harvesting does increase early postoperative discomfort, and with longer cardiopulmonary bypass times, minor morbidities (such as postoperative bleeding) are slightly increased. In the opinion of the authors, the trade-off of improved long-term results warrants this early morbidity, and most analyses also show reduced risk-adjusted operative mortality with increasing IMA’s. Lastly, all-arterial coronary bypass may be most appropriate for elective management of severe multi-vessel or left main coronary disease, whereas patients with acute myocardial infarction or less serious coronary obstruction probably fare better with PCI (30). In this way, surgery and PCI are becoming complementary rather than competitive, and in coming years, all-arterial coronary bypass should play an increasingly important role in the treatment of coronary artery disease. complex mammary artery bypass grafting. J Thorac Cardiovasc Surg 1986;92:832-846.
bypass. Surgery of the Chest, 6th ed, Saunders, Philadelphia;1993:1909-1925. 3. Rankin JS, Tuttle RH, Wechsler AS, et al. Techniques and benefits of multiple internal mammary artery bypass at 20-years of followup. Ann Thorac Surg 2007;83:1549-1555. 4. Collins P, Webb CM; Chong CF, et al. Radial artery versus saphenous vein patency randomized trial: 5-year angiographic follow-up. Circulation2008;117:2859-2864. 5. Kolessov VI. Mammary artery-coronary artery anastomosis as method of treatment for angina pectoris. J Thorac Cardiovasc Surg 1967;54:535-544. 6. Loop FD, Lytle BW, Cosgrove DM, et al. Influence of the internal mammary artery graft on 10-year survival and other cardiac events. N Eng J Med 1986;314:1–9. 7. Lytle BW, Cosgrove DM, Saltus GL, et al. Multivessel coronary revascularization without saphenous vein: long-term results of bilateral internal mammary artery grafting. Ann Thorac Surg 1983;36:540–551. 8. 3. Lytle BW, Blackstone EH, Loop FD, et al. Two internal thoracic arteries are better than one. J Thorac Cardiovasc Surg 1999;117:855–72. grafting on survival during 20 postoperative years. Ann Thorac Surg 2004;78:2005–12. 10. Lytle BW, Loop FD. Superiority of bilateral internal thoracic artery grafting: it’s been a long time comin’. Circulation 2001;104:2152–2154. 11. ElBardissi AW, Aranki SF, Sheng S, et al. Trends in isolated coronary artery bypass grafting: An analysis of the STS Adult Cardiac Surgery Database. Ann Thorac Surg, in-press. 12. Tatoulis J, Buxton BF, Fuller JA. The right internal thoracic artery: The forgotten conduit—5,766 patients and 991 angiograms. Ann Thorac Surg 2011; 92:9-17. 13. Fukui T, Tabata M, Manabe S, et al. Angiographic outcomes of right internal thoracic artery grafts in situ or as free grafts in coronary artery bypass grafting. J Thorac Cardiovasc Surg 2010;139:868-873. 14. Jung S-H, Song H, Choo SJ, et al. Comparison of radial artery patency according to proximal anastomosis site: Direct aorta to radial artery anastomosis is superior to radial artery composite grafting. J Thorac Cardiovasc Surg2009;138:76-83. 15. Schwann TA, Zacharias A, Riordan CJ, et al. Sequential radial artery grafts for multivessel coronary artery bypass graft surgery: 10-year survival and angiography results. Ann Thorac Surg2009;88:31-39. 16. Agrifoglio M, Kassem S, Alamanni F. In situ right internal thoracic artery is usually long enough for grafting the circumflex artery through the transverse sinus. J Thorac Cardiovasc Surg 2010;140:731-732. 17. Burfeind WR, Glower DD, Wechsler AW, Tuttle RH, Shaw LK, Harrell FE, Rankin JS. Single versus multiple internal mammary artery grafting for coronary artery bypass: 15-year follow-up of a clinical practice trial. Circulation 2004;110 (Suppl II):II27-II35. 18. Berreklouw E, Rademakers PPC, Koster JM, et al. Better ischemic event-free survival after two internal thoracic artery grafts: 13 years of follow-up. Ann Thorac Surg 2001;72:1535–1541. 19. Endo M, Nishida H, Tomizawa Y, et al. Benefit of bilateral over single internal mammary artery grafts for multiple coronary artery bypass grafting. Circulation 2001;104:2164–2170. 20. Tavilla G, Kappetein AP, Braun J, et al. Long-term follow-up of coronary artery bypass grafting in three-vessel disease using exclusively pedicled bilateral internal thoracic and right gastroepiploic arteries. Ann Thorac Surg 2004;77:794–799. 21. Calafiore AM, Di Giammarco G, Teodori G, et al. Late results of first myocardial revascularization in multiple vessel disease: single versus bilateral internal mammary artery with or without saphenous veins. Eur J Cardiothorac Surg 2004;26:542–548. 22. Guru V, Fremes SE, Tu JV. How many arterial grafts are enough? A population based study of mid-term outcomes. J Thorac Cardiovasc Surg 2006;131:1021–1028. 23. Parsa CJ, Shaw LK, Rankin JS, et al. Twenty-five year outcomes after multiple internal mammary artery bypass. Submitted for publication. 24. Tranbaugh RF, Dimitrova KR, Friedmann P, et al. Radial artery conduits improve long-term survival after coronary artery bypass grafting. Ann Thorac Surg2010;90:1165-1172. 26. Savage EB, Grab JD, O’Brien SM, et al. Use of both internal thoracic arteries in diabetic patients increases deep sternal wound infection. Ann Thorac Surg 2007;83:1002-1006. 27. Graf K, Sohr D, Haverich A, et al. Decrease of deep sternal surgical site infection rates after cardiac surgery by a comprehensive infection control program. Interactive CardioVascular and Thoracic Surgery 2009;9:282-286. 29. Vander Salm TJ, Okike ON, Pasque MK, et al. Reduction of sternal infection by application of topical vancomycin. J. Thorac. Cardiovasc. Surg 1989; 98:618-622. 30. Smith, PK, Califf, RM, Tuttle, R, et al. Selection of surgical or percutaneous coronary intervention provides differential longevity benefit. Ann Thorac Surg 2006;82:1420 –1429. Figure 1: Two configurations of all-arterial coronary bypass. See text for details. Figure 2: CTA imaging of the most common type of all-arterial grafting configuration (A) in the author’s practice. 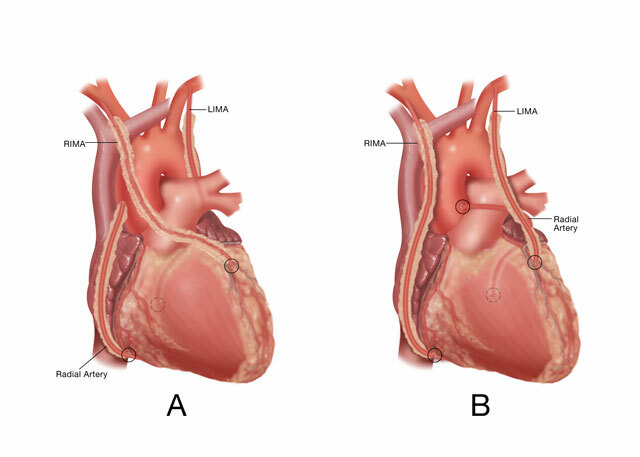 The RIMA connects to the LAD, the LIMA is a sequential graft to 2 circumflex marginal arteries, and the RA is used for the distal RCA. 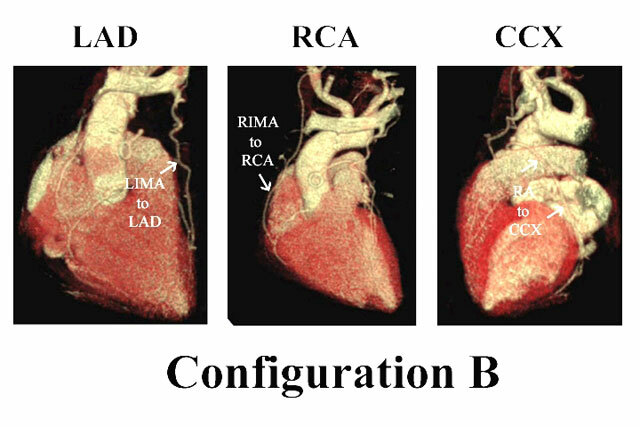 Figure 3: The second most common configuration with LIMA-LAD, RIMA-RCA, and RA-CCX grafts. Figure 5: Fatal and non-fatal events over 20-years after single versus multiple IMA grafts (reproduced from ref. 3). The composite of all 4 events was reduced by an average of 19% over the first 15 years (17). Data were adjusted with a Cox model to compensate for minor differences in baseline characteristics. See text for details. Figure 6: In the larger Duke University series (n=19,483) followed over 25 years, single IMA (SIMA) and adjunctive saphenous vein grafts were performed in 87% of CABG patients, multiple IMA grafts (MIMA) in 4%, and no IMA’s (NIMA) in 9%. The composite of all-cause death, non-fatal MI, subsequent PCI, and redo CABG was the outcome variable. A small gradient in patient age existed between groups, with age in NIMA>SIMA>MIMA, so that further analysis, including multivariable risk adjustment, will be required. However, initial assessment reveals continually improving outcomes as arterial grafts are increased (reproduced from ref. 23).